Emirates is introducing new, redesigned headsets on economy class to enhance the travel experience of those in coach. Effective from June, all Emirates A380s will offer the new headsets, and there are also plans to roll them out onto the B777 fleet later this year. Having been redesigned in order to improve sound quality and reduce ambient cabin noise, the headset now sports a rectangular shape that makes it more ergonomic, while the faux leather ear cushions ensure a more comfortable experience on longer flights. 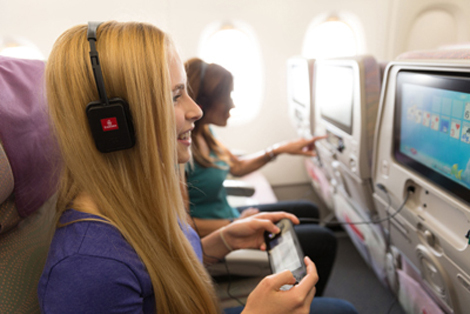 “This new design will lift the audio quality to a new level, and now customers can completely immerse themselves in the broad variety of entertainment choices offered onboard,” said Patrick Brannelly – divisional vice president, customer experience (IFE & Connectivity). Meanwhile, young travellers will also receive new smaller sized headsets available in a range of colours. These will also have larger speakers for a much-improved sound quality.